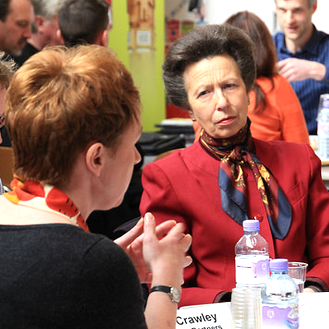 I was honoured to be invited to host a ‘cafe conversation’ at this year’s CSCLeaders event in Edinburgh last week with HRH Princess Anne and eighteen senior Commonwealth Leaders. The Commonwealth Study Conference is global leadership programme for exceptional senior leaders selected each year from government, business and NGOs across the 53 countries of the Commonwealth. Kist with the Children’s Hospice Association (CHAS) to use digitally tagged objects to share the personhood of children who cannot talk. My co-host, Alan Crawley from Optima Partners underlined how technology is a relatively small part of a solution – the experience and services that are created around the use of technology make the difference between adoption and failure. The enthusiasm and passion of the participants was incredible, with conversations around engaging people in education and health programmes and how to use co-design to effect policy and behaviour change. Thanks go to Sarah Ronald from Nile Experience and Service Design for connecting me to organiser Steve Plummer from Common Purpose.